The average gas price in the state of Michigan has just dropped below $2 per gallon for the first time in nearly 1,000 days. GasBuddy sent out the alert on Tuesday night, saying the average price at 8:35 fell to an average of $1.999 per gallon. 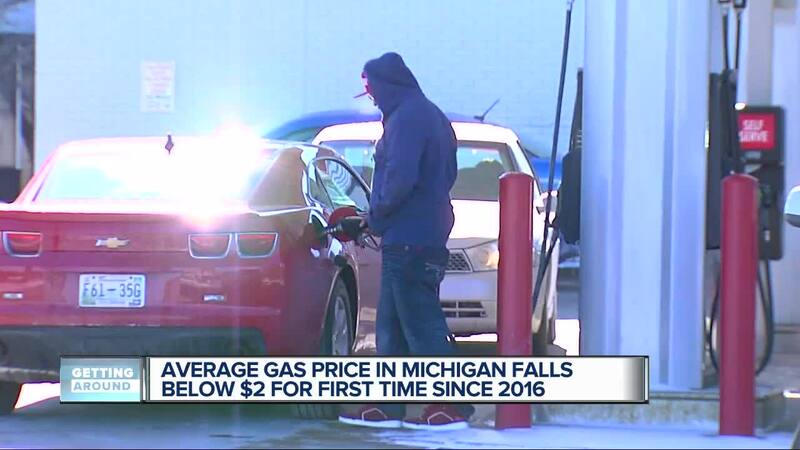 (WXYZ) — The average gas price in the state of Michigan has just dropped below $2 per gallon for the first time in nearly 1,000 days. GasBuddy sent out the alert on Tuesday night, saying the average price at 8:35 fell to an average of $1.999 per gallon. With the drop, Michigan became the 13th state where gas fell below the $2 mark, joining Missouri, Oklahoma, Ohio, Texas, Arkansas, Louisiana, South Carolina, Mississippi, Alabama, Kansas, Kentucky and Tennessee. The last time GasBuddy reported average prices below $2 per gallon was on April 11, 2016, which was 142 weeks ago. On Wednesday, the company is expected to release its 2019 fuel price outlook report.